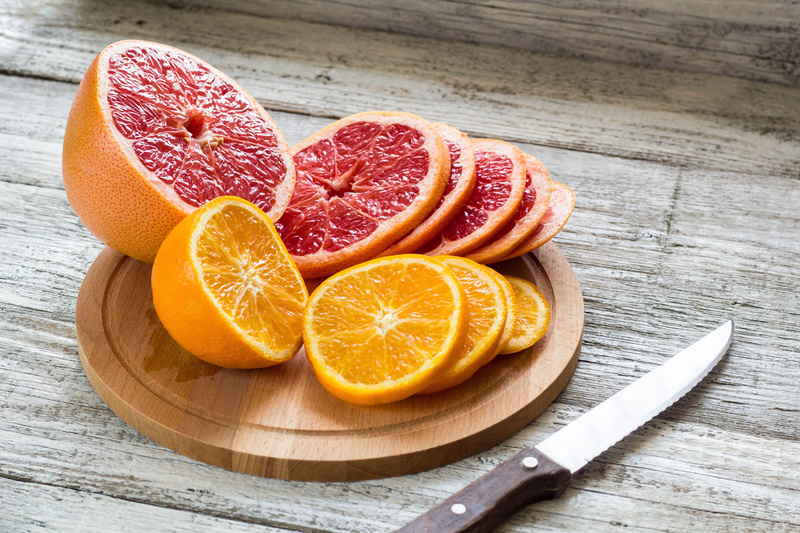 Oranges and grapefruit are easy to put in fruit salads and smoothies, but stretch the limits of your imagination and consider using these seasonal sensations in your savory dishes, as well. Segmented citrus in salads adds sweetness and acidity, providing contrast to the salty items you love – like olives and cheese. Heralded among the best foods for your immune system, citrus fruits are powerful antioxidants, preventing cell damage from free radicals and charging your system with Vitamin C and carotenes. Here are two variations on a simple recipe that highlight the use of citrus in salad. The first has fresh parsley, an herb-packed with Vitamin C to increase the dish’s immune-strengthening properties. The second has avocado, which makes the fat-soluble lycopene in grapefruit more bio-available. Both include fennel, an excellent digestive aid and liver detoxifier. Thinly slice 1 small fennel bulb and place in a bowl. Remove the peel of 3 Valencia oranges and, holding over the bowl of sliced fennel, segment the citrus and squeeze any of the juice remaining in the membrane into the bowl. This technique is called “suprèming.” (I love the how-to video from Chef Ming Tsai here.) The juice from the citrus will marinate the fennel while you prepare the remaining ingredients. Remove the pits from ¼ cup of Italian oil-cured olives and halve lengthwise. Rinse and tear 2 heads of sweet lettuces such as Bibb or Boston lettuce, and combine in a bowl with the olives. Strain the citrus and fennel from the juice and add to the bowl with the lettuce and olives. Whisk a tablespoon of honey into the citrus juice, then slowly stream in good quality extra virgin olive oil while whisking until emulsified. Pour the citrus vinaigrette over the salad and toss to combine. Top with freshly chopped parsley and enjoy. Suprème 2 medium grapefruit over the bowl and follow the above instructions to marinate the fennel while you prepare the remaining ingredients. Run a vegetable peeler down the length of a wedge of Parmigiano Reggiano cheese to create long thin strips. Set aside. Slice or cube 1 ripe avocado and set aside. Place 5 oz baby arugula in a mixing bowl and set aside. Strain the citrus and fennel from the juice and set aside. Pour the citrus vinaigrette over the arugula, tossing to combine, and transfer to a serving bowl. Top with the fennel and segmented grapefruit, followed by the avocado and finished with the Parmigiano cheese. Crack some fresh black pepper over the top and enjoy.